Because of their ability to cut virtually any shape in tool steel without affecting the heat treat, OMAX systems have long been used by tool and die shops to modify and/or add new features to existing die components such as die stripper plates. At one time this required either a special positioning fixture or careful manual positioning of the existing plate on the cutting table to insure that the added feature was cut in the correct location. Such a process could be time consuming and was complicated by the fact that the abrasive waterjet stream does not have a crisp well-defined cutting edge to locate from. The solution to this need was the Precision Optical Locator (POL). The POL uses a small video camera equipped with a microscope lens with high-resolution crosshair. The camera is precisely mounted vertically to the z-Axis to aim downward exactly parallel to the abrasive cutting stream. 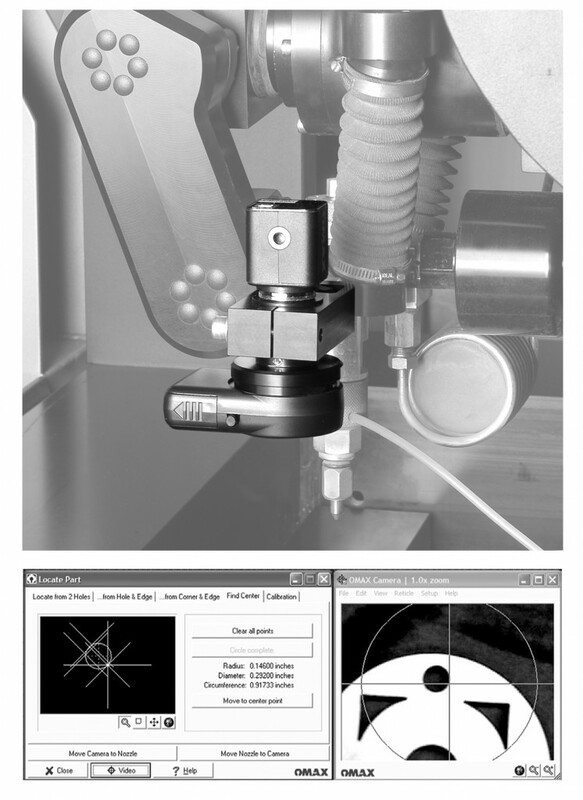 When the POL is first installed, a simple calibration process is used to determine the precise X and Y offset between the center of the lens crosshair and the exact center of the abrasive waterjet cutting stream. A special software package permits the system operator to view the microscope image on the controller screen and use that image to precisely locate reference points on the component to be modified. The reference points may be two corners, a corner and an adjacent line or the center of one or more existing holes. The software then automatically orients the tool path for the part to be modified to align precisely with the part itself on the cutting table. This means that no special manual alignment of the part to be modified is needed. The part can be clamped in any location or orientation on the cutting table and the tool path is automatically aligned to match it. The calibrated crosshair/cutting stream offset is then automatically applied and the nozzle is now lined up precisely with the tool path. Over the years, tool and die shops have found the POL to be an invaluable time- and money-saving accessory. However, what has made the Precision Optical Locator such a widely-used accessory is that the applications extend well beyond the original purpose for which it was designed. Indeed the POL is now used by a wide range of manufacturing and repair shops that go far beyond the tool and die industry. The POL permits the OMAX system to be used to add virtually any feature to any part at any time during its manufacturing process. Features added range from simple round or rectangular holes to narrow slots to special patterns that would normally require expensive custom tooling or might not even be possible with conventional machining processes. This not only saves money during manufacturing but also permits part designers to design things that previously would have been very difficult to manufacture. In addition to adding features to a part during manufacture, shops have found the POL to be an ideal tool for reverse engineering a part. The POL can be used directly with the OMAX Layout software to precisely locate points on an existing part that has been placed on the cutting table and thus recreate an accurate drawing of that part in Layout. This permits an exact duplicate of the part to be quickly manufactured. This capability has been used by OMAX shops for making no-longer-available repair and replacement parts for applications ranging from antique automobile restoration to repair of aging farm machinery to in-the-field urgent repair of military vehicles and equipment. Accessories such as the Precision Optical Locator, that provide greater capability to abrasive waterjet cutting systems, can expand applications in ways that even those who designed the accessory have not anticipated. That is one of the things that makes abrasive waterjet technology so exciting. Today’s applications are only the beginning. Remember–our goal is an abrasive waterjet in every shop. What Really Determines the Time to Make a Part?